So, good news and bad news (? maybe?). Good news: Boozle is not over forever, and I’m still planning on continuing it. There’s still a good 20 chapters or so left in that story. The Bad News: surely you’ve noticed that I’ve been slacking on Boozle. It’s a combo of personal life stuff (a lot has happened) but also, I’m just having trouble staying motivated on this project. So! I’m changing gears. 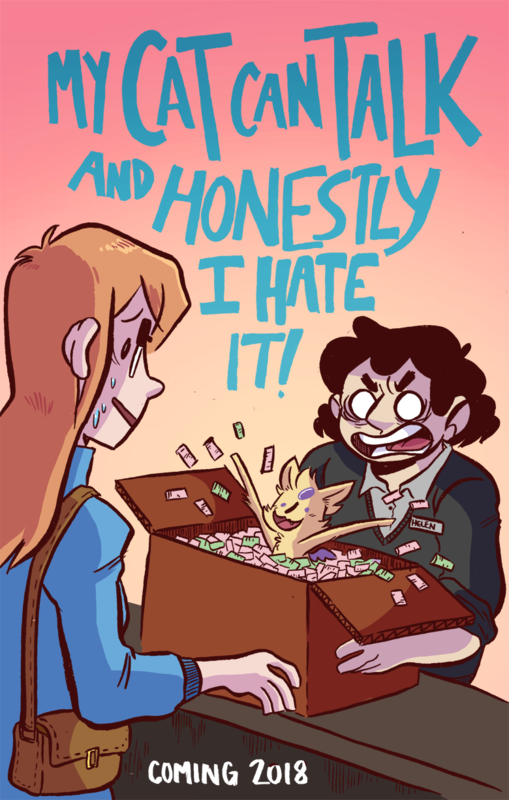 My Cat Can Talk and Honestly I Hate It is a slice-of-life story about Helen Wampole, a 20-something working a retail job until one day she accidentally hits a magical flying cat creature with her car. This story is near and dear to me right now and I suddenly just really want to draw it. I’ll be posting it here (so that I can keep everything in one place, and also, I hate making new websites) so you don’t have to go anywhere. I don’t know how long it’ll take me to draw this, but it’s going to be b&w, and I’m going to be updating in large chunks so I’m not planning on it taking me more than like two years. I 100% understand if this is not your thing and wanna bail until Boozle comes back. But I think this comic is gonna be good and I hope you stick around. Also, I’m planning on starting the comic in 2018, but I’ll keep this site updated with other projects and things until then!